In 1940, David O Selznick was looking for a follow-up to his blockbuster Gone with the Wind the year before. He focused his attention on a then-little-known-in-the-US director named Alfred Hitchcock. Together, they created one of Hitch's most opulent productions by bringing to the screen this Daphne Du Maurier tale of love and obsession. Selznick was a very hands-on producer, which went completely against Hitchcock's usual directing style of having complete control. However, new to the studio machine as he was, Hitch had to give some quarter to Selznick in order to solidify his budding Hollywood career. His efforts paid off, as the success of Rebecca helped liberate him from his stultifying contract and give him the control he preferred, something rare for a director in the '40s. Rebecca is a tale of loss, of both the destructive power and the healing abilities of great love, of how the rich and propertied can occasionally learn a great deal from the humble and meek. But mostly, Rebecca is a tale of mystery and intrigue, one that keeps the viewer guessing until the very end as to the true fate of the eponymous late wife of wealthy Maxim de Winter. Though dead, Rebecca plays a major, albeit off-screen, part in the story of Maxim de Winter, played by a very dashing Laurence Olivier, and his new wife (Joan Fontaine), a somewhat mousy ladies' companion who Maxim met on a vacation to Monte Carlo. Once the latest Mrs. de Winter returns to the family estate of Mandalay, she becomes increasingly uncomfortable in both the marriage and the mansion, as every inch of the estate seems filled with the presence of the former lady of the manor. Turning this odd triangle into a quartet is the head housekeeper, Mrs. Danvers (Judith Anderson), who is as devoted to the deceased Rebecca as she is antagonistic toward her new mistress, and determined to make the new Mrs. de Winter feel as unwelcome as possible at Mandalay. As the second Mrs. de Winter tries desperately to fit in to a life to which she was not born, she becomes more anxious over her husband's unwillingness to discuss his first wife, and increasingly feels he is hiding something from her. Is he still in love with the beautiful and vivacious Rebecca? Was her tragic end truly an accident? And what dark secrets does Mrs. Danvers hide behind that calm exterior? The audience is as much in the dark as the second Mrs. de Winter, and takes her journey of discovery right along with her, as the past is revealed and the true nature of life at Mandalay is uncovered. So why should modern audiences check out this film? Certainly a big draw is Alfred Hitchcock. Although Hitch felt that Rebecca was far more Selznick's film than his - Selznick being a micromanager of legendary proportions - it is still amazing how much of Hitchcock's genius shines through Selznick's meddling. 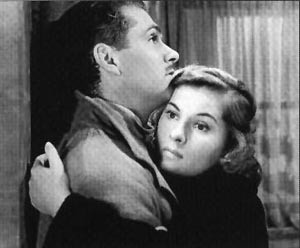 Hitch himself felt in later years that Rebecca was really never his film, but the legendary director's imprint is on the movie all the same, and Selznick's stultifying oversight couldn't completely douse Hitchcock's talent. There's also the chance to see Laurence Olivier in action. For audiences who only know him by name or from his latter films, it is surprising to see how very handsome he once was. And watching the actor in his prime makes it easy to understand why he was held in such high regard not only by audiences but by critics and other actors. His Maxim de Winter is by turns moody, good-natured, loving, secretive, filled with rage and stricken with remorse, and the turn-on-a-dime emotions are always pitch-perfect. It is a marvel. But perhaps the most interesting portrayal in the film, and certainly another reason to seek out this film, is the housekeeper, Mrs. Danvers. Given the era, the lesbian undertones of the character remain just that, although it is not difficult to see the subtext of Danvers' obsession with her deceased employer. But Judith Anderson brings so much more to a role that could easily have been parody. There is a quiet maliciousness that fairly bubbles beneath her ever-so-proper servant's attitude toward the second Mrs. de Winter, and the obvious delight Danvers takes in torturing the new mistress of Mandalay with memories of the former lady of the manor is deftly handled. Mrs. Danvers remains subtle in her attempts to undermine the new wife's confidence in herself and her husband's love and her reputation, but there is no mistaking her loathing for the woman who dares try replacing her beloved former employer. Danvers scenes at the end of the film are both revelatory and chilling, as her true persona is finally exposed. In all, I'd say the best reason for checking out Rebecca is it's one whale of a good film, one that doesn't reveal so much of the mystery so early in the film that the audience misses out on the fun of trying to puzzle things out along with the characters.